1X/2X - $66.99 3X/4X - $66.99 Only 8 left! We've been trying to wrap our head around this skeleton predicament and we believe that we finally solved the situation. This cozy skeleton costume is perfect for those who are without skin because the zip-up dress is printed with white bones, while the soft fleece fabric shields the body with comfortable warmth. Attached to the back of the mini dress is an oversized hood featuring a skeletal face. Now skeletons can sport their classic bony look while shivering way less than they did before. Hopefully, this cool costume can help out skeletons everywhere! Now YOU can also get the ensemble that all the skeletons are yearning for. 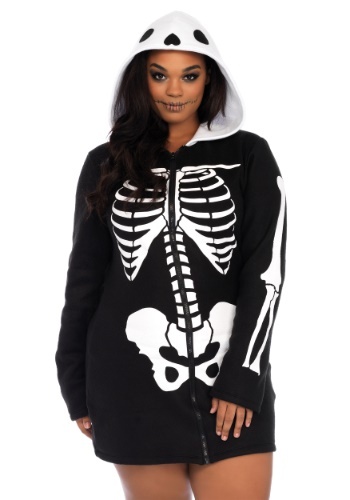 This cozy skeleton costume is designed especially for plus size ladies who want a creepy look this Halloween. Accessorize this unique and comfy costume with some dark makeup, fishnet tights, and a pair of killer black heels!